This site is an independent information source about various Italian wines started by a wine enthusiast with the purpose to create one site for all sorts of Italian wine related information. The information that you will find here will be about the several varieties of Italian wines, their history, which region (such as Piedmont and Tuscany) they come from and what grapes are used to create them. Per wine an impression is given about which good wineries produce the wines as well as what vintages are good (and bad), how long you can let the wines age as well as what types of food go well with them. In short: useful information for wine lovers! Currently only a small selection of wines is added to the site. More Italian wines will be added in the near future so please do not hesitate to come back once in a while to see what's new. 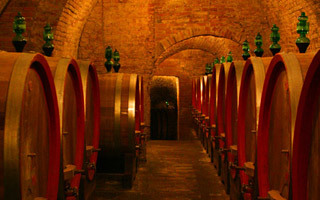 Click here to proceed to the Italian wines .